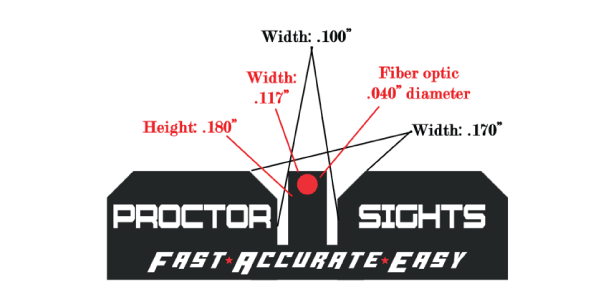 Proctor Y Notch Sights are designed to be Fast Accurate Easy. The main premise behind the design is allowing fast easy vision with less room for sight misalignment. The Y shaped notch allows fast vision and target acquisition and makes it very easy to visually center the front sight in the rear notch for optimal sight alignment. The contrast between the black rear sight and fiber optic front sight allows shooters eyes to process information extremely fast. The sights have a black nitride finish, which is extremely corrosion and rust resistant and also provides very nice visual definition to the sights. These sight sets have been thoroughly tested and provide POA=POI when installed and USED properly. 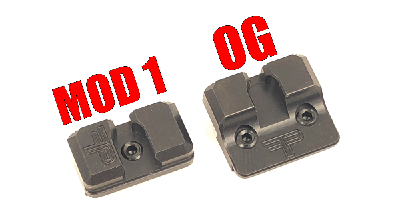 Solid Black Fixed Rear Sight: .185 Tall x .100 to .170" wide top of "Y"